Version 10.0.12.1 of VintaSoft Barcode .NET SDK has been released. Vintasoft.Barcode.Web.Services.dll, Vintasoft.Barcode.Web.HttpHandlers.dll, Vintasoft.Barcode.Web.WcfServices.dll, Vintasoft.Barcode.Web.ApiControllers.dll and Vintasoft.Barcode.Web.Api2Controllers.dll assemblies now reference to version 1.0.9.1 of Vintasoft.Shared.dll and Vintasoft.Shared.Web.dll assemblies. Minor improvements in ASP.NET demos. Version 10.0.13.1 of VintaSoft Barcode .NET SDK has been released. 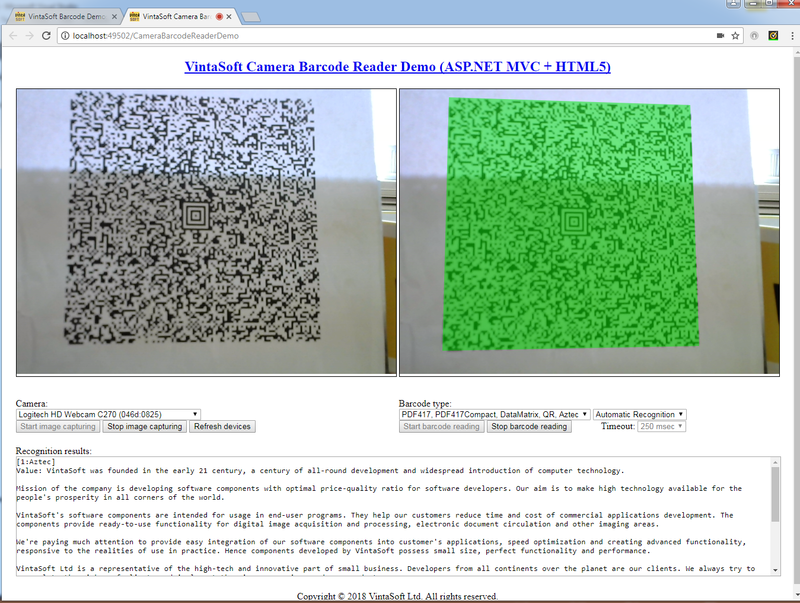 Added ASP.NET MVC and ASP.NET WebForms demos, which show how to capture image from HTML5 camera and recognize barcodes in captured image. Improved recognition of Aztec barcodes. Improved the recognition of QR barcodes, which do not fully conform to the QR specification. Improved the recognition of RSS Expanded Stacked barcodes. Improved the algorithm that calculates the ReadingQuality parameter for EAN/UPC barcodes. Fixed the bug in ISO15415 barcode print quality test. The bug could occur if region of 2D barcode was outside the image. Version 10.0.14.1 of VintaSoft Barcode .NET SDK has been released. Improved the recognition of RSS / GS1 DataBar barcodes. Version 10.0.15.1 of VintaSoft Barcode .NET SDK has been released. Now Web API 2 controller in Vintasoft.Barcode.Web.Api2Controllers.dll is based on ASP.NET Web API 5.2.4. Improved recognition of Interleaved2of5 barcodes. Fixed the bug in algorithm that recognizes RSS Expanded Stacked barcodes when small scan interval is used. The bug present only in version 10.0.14.1. Fixed the bug in algorithm that generates RSS Expanded barcodes. Version 10.0.16.1 of VintaSoft Barcode .NET SDK has been released. Fixed the minor bug in algorithm of ISO/IEC 15415 barcode print quality test. Version 10.0.17.1 of VintaSoft Barcode .NET SDK has been released. Now algorithm, which recognizes QR barcodes, always uses the ReaderSettings.ExpectedBarcodes property for calculating the maximum count of expected QR barcodes. In previous versions only the Automatic recognition mode used the ReaderSettings.ExpectedBarcodes property for calculating the maxium count of expected QR barcodes.